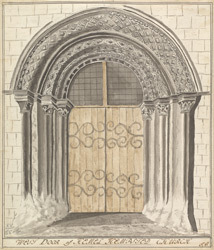 View of a door in St Mary’s Church in Hemel Hempstead, Hertfordshire. The building work on the church started in 1140 and was eventually completed in 1180. The basic structure of the church is much the same now as when it was built except for the addition of the vestry and porches and the enlargement of some of the windows. It is thought to be the most complete Norman church in Hertfordshire.